When most people think of a great love story literary examples like Romeo and Juliet come to mind. Actual examples of great love are usually a little less glamorous. They are, however, much greater. Grand passion can create an enduring story but it is the little, nitty, gritty life and sanity sustaining sacrifices that make a great and enduring love story. A great love is worked on daily and lived faithfully. When I think of great love stories I think of my Nan and Pop, married over 50 years and still holding hand when they walked down the street together. I think of my parents, married 40 years and still laughing together and enjoying their life enormously. My in-laws married a little more than 40 years and also enjoying their retirement. Then there is the example in my own house. A man who works sixteen hour days and still makes time in the morning to set up the coffee pot and get it all ready for when I drag myself out of bed. A guy who gets very little sleep but starts up the dishwasher before he comes to bed and empties it before he leaves in the morning. This is a true hero. It was one of these IM’s yesterday that lead to this essay. I should and could write everyday about the many gestures that he makes that make my life so wonderful – but some gestures just smack you in the head. I was having a “day”. Pregnancy exhaustion, a bad cold and children who were, shall we say, less than cooperative. He IM’s that he will be late but can he bring home anything. CHOCOLATE, I say. Now I respond with that request often and sometimes, if he can manage it, I get a Hershey Bar from Penn Station. That great man must have sensed some desperation in my capital letters. He stopped at Godiva on the way home. He picked out my absolute favorite chocolates and brought home a lovely gold foil box, wrapped in pretty tissue and in a gold gift bag. It was such a huge surprise. I am not eloquent enough to express how much this little side trip to the chocolate store meant to me. This is a love story that is being written everyday. It will never end because we intend to leave this legacy of love to our children. To show them the joy in living for someone’s happiness, the necessity of putting God first in your marriage and that sacrifice can bring great contentment. This is a love story that I am grateful to be a part of and that I thank God for many times each day. This is a great love story. Beautiful and perfect, Mary Ellen. Thank you for sharing this memorable reflection. He is pretty incredible. Thanks for the kind words. 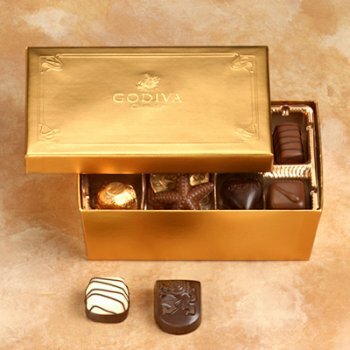 Oh Mary Ellen, you’ve got a keeper, Godiva no less….beautifully written. Knowing you and Dave as well as I do, I can testify to the absolute truth in your beautiful tribute! You truly married a gem among men. I’m tearing up *and* craving Godiva. Mary Ellen, your chocolate story rings true here…I’ve have a VERY similar story (or two), with my dh (Dave…must be the name) stopping at Godiva at Union Station for me. CHOCOLATE!! !